When our daughter called to say she and her boyfriend wanted to come by to visit with their new Scottie puppy, we were delighted. We decided to have a casual lunch together. 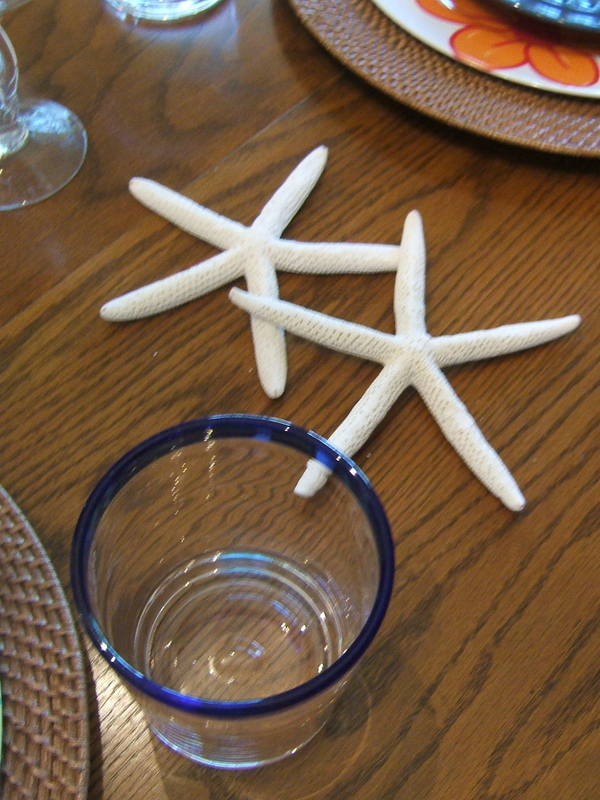 I had been thinking about a beach-themed table setting. 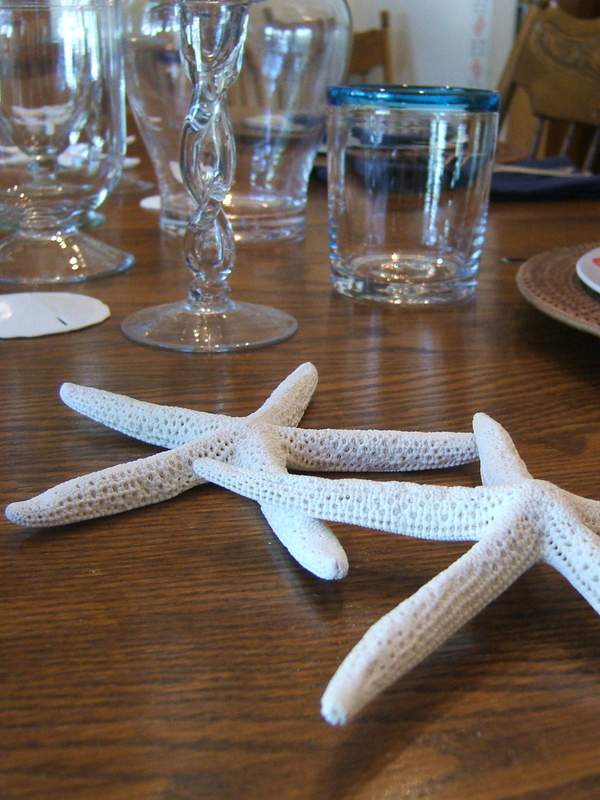 I decided to pull out the lovely starfish and sand dollars (my favorite!) brought back from the beach as a gift from our daughter last year. 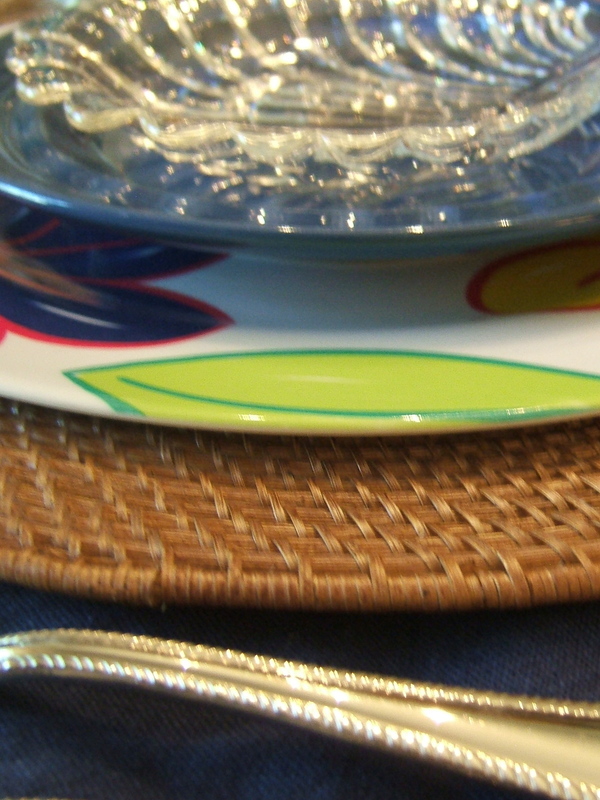 I used my rattan chargers, topped with a tropical floral design on a melamine dinner plate. 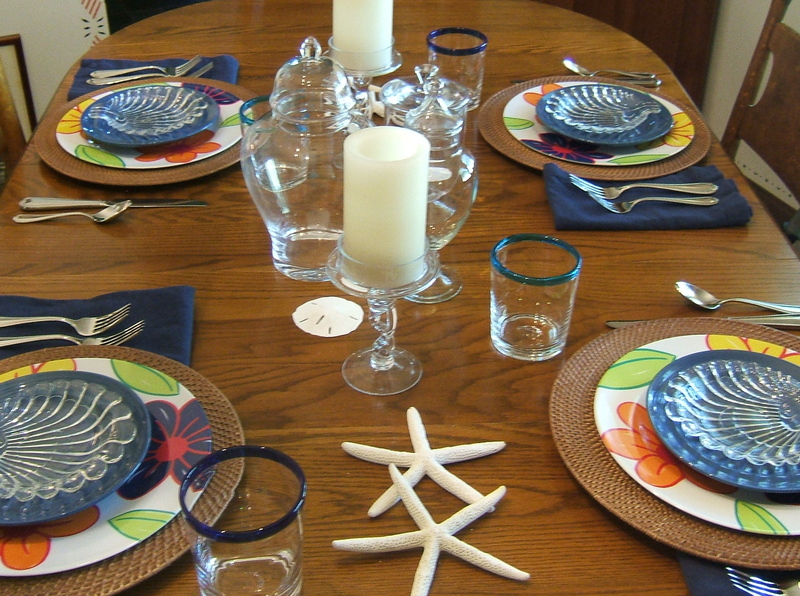 Don’t pass up those “plastic” dishes at yard sales and thrifts if they have an interesting design. 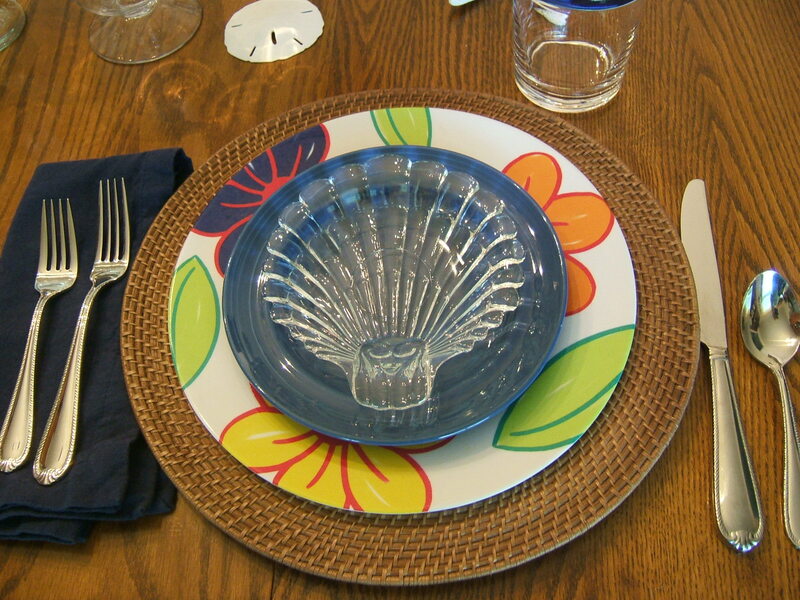 I then layered a blue salad plate with a shell shaped dish topping the dish stack. Both of these are thrift finds. The glasses were a birthday gift from my sweet mother-in-law. I believe she found them at Target. The napkins and stainless are from my collection. We had a very simple lunch of pulled pork barbecue on potato rolls, deviled eggs, cucumbers and onions with an Asian twist, and caramel apple salad. The new puppy just settled himself under the table and was good as gold through the whole meal as we enjoyed our lunch and spending time together. I hope to join the parties at The Thrifty Groove’s Thrifty Tablescape Party, Between Naps on the Porch for Tablescape Thursday, and StoneGable’s On The Menu Monday. 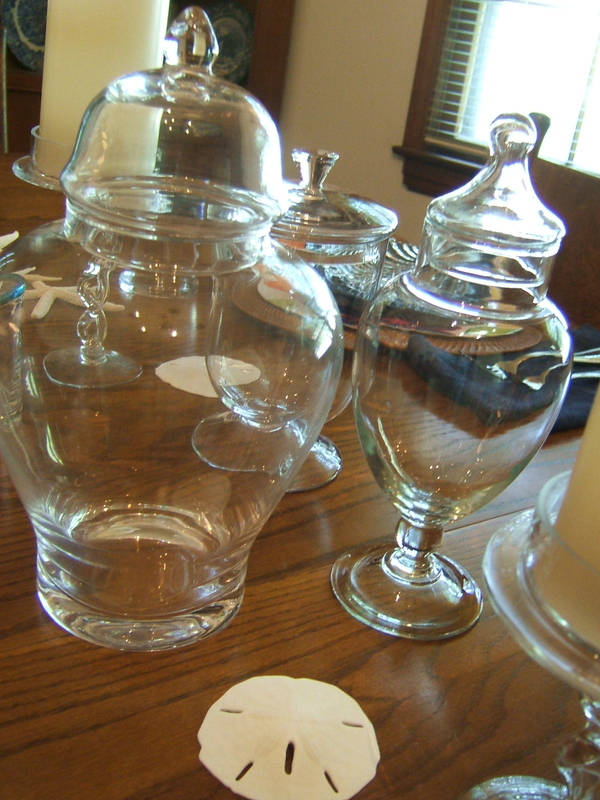 This entry was posted in Apothecary Jar, Dishes, Garage Sales, Scotties, Tablescaping, Thrifting, Uncategorized, Yard Sales. Bookmark the permalink. Such a pretty table you set up. Wow, the lunch sounds wonderful too. Hope you all had a great time. What a pretty summer table. Nothing quite like puppy love. Thanks for your sweet visit to my post this week as well. Hi, Tammy! 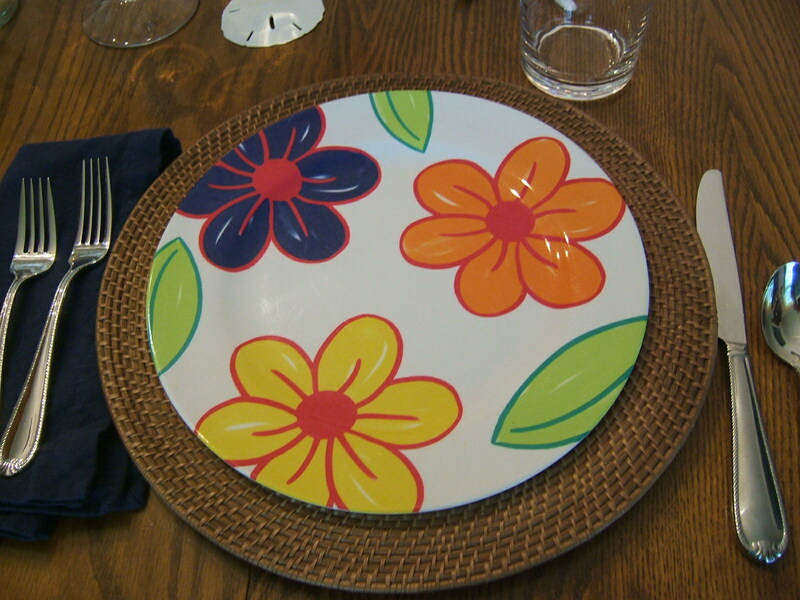 I agree with you on the melamine dishes…they are a great and inexpensive way to dress a table, so get ’em while you can! These you have on your post are great with all the summery color! I’m sure your daughter and her boyfriend appreciated the effort you put into making your impromptu lunch extra special. Very nice! 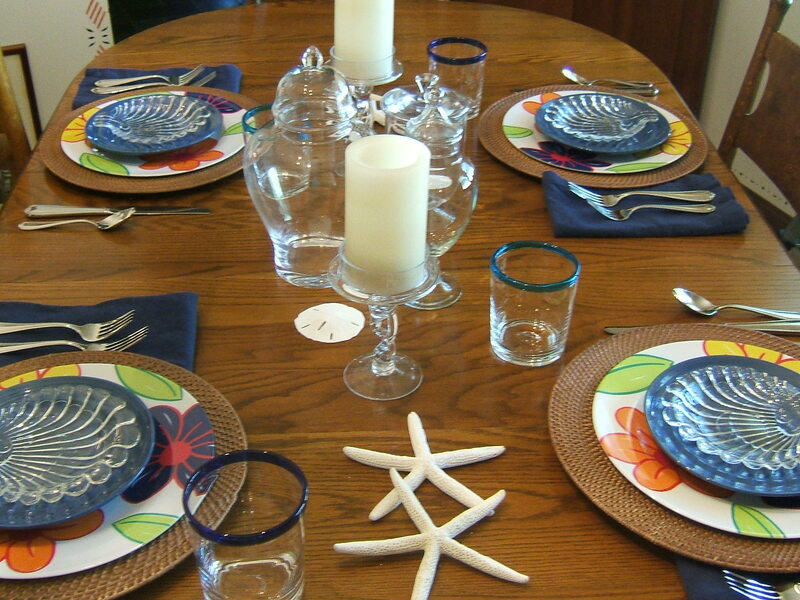 Love all your collections and i can recall my mom having melamine dishes too…wish i still had those! Thank you so much for your sweet comment about my screened in sun-room that Susan featured for Metamorphosis Monday. We’ve enjoyed our little room so much this summer minus the bugs and the baking sun! Plus I can go in and change it up every once in a while to suite my mood and or season!